Can you paint a newspaper box or is that a no-no? I’m thinking it’s okay. 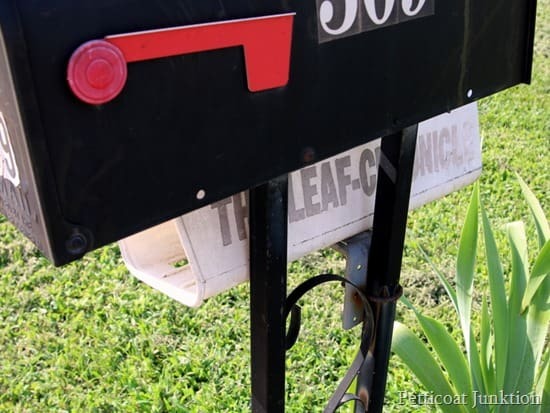 What happens if I paint the box and the newspaper guys don’t like that…..do they throw my paper in the driveway…..or maybe they quit delivering the newspaper. I don’t think so. I want to refresh the mailbox and I know that’s okay with the USPS. So I’m going to paint everything. Mailbox, paper box, metal support, are all getting a makeover. I could use some help selecting paint colors. 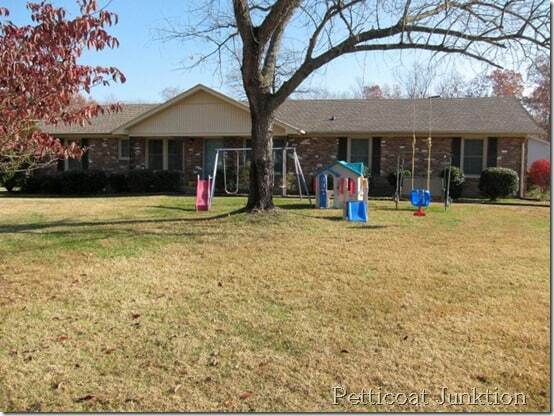 The JTS and I have slowly been working on the outside of the house adding a little curb appeal. It’s hard to believe, but it’s been 3 years since the JTS painted the house shutters. They still look good as new. 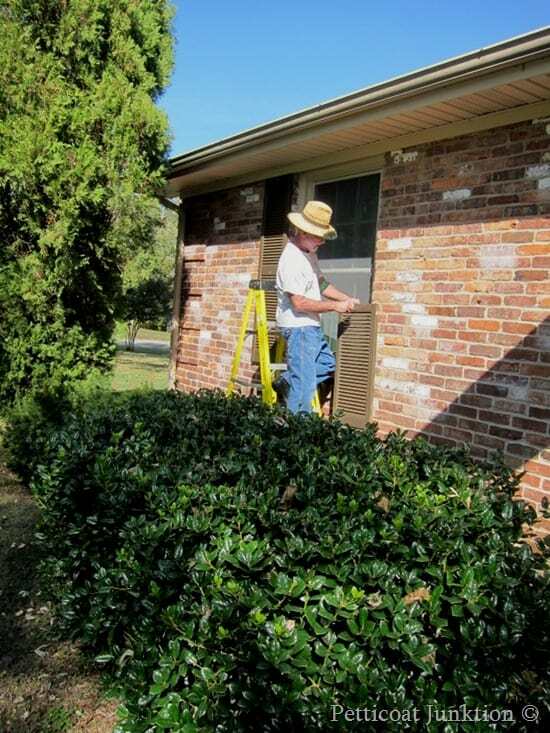 You can see how he painted the shutters by clicking here. 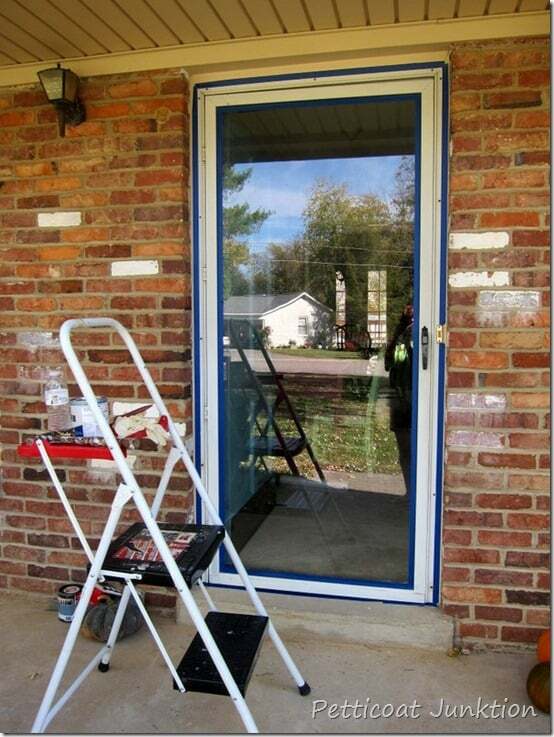 I painted the front door and also the metal frame around the storm door. I wasn’t sure if the metal would hold the paint but the door looks good as new too. 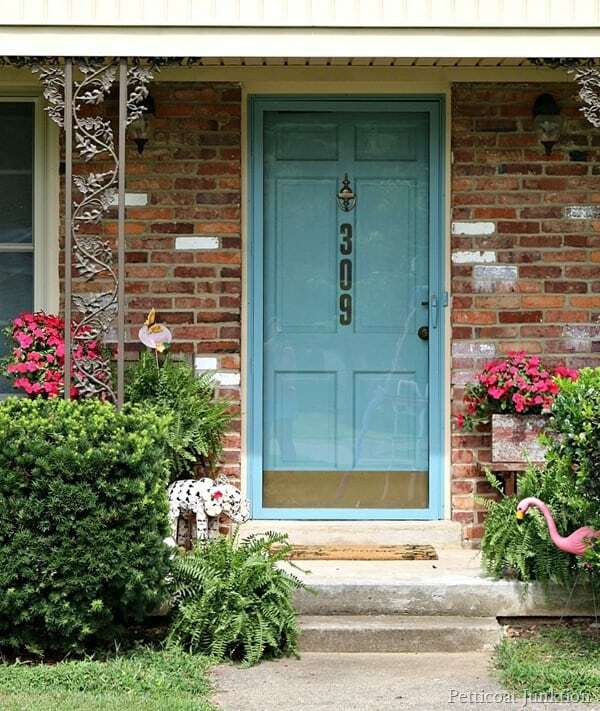 I love that the metal isn’t glaring white and blends in with the blue door. I have a tutorial on the paint job here. I didn’t write a post about the JTS replacing the pair of lights on either side of the door. You can see the old ones in this photo and the new ones in the photo below. 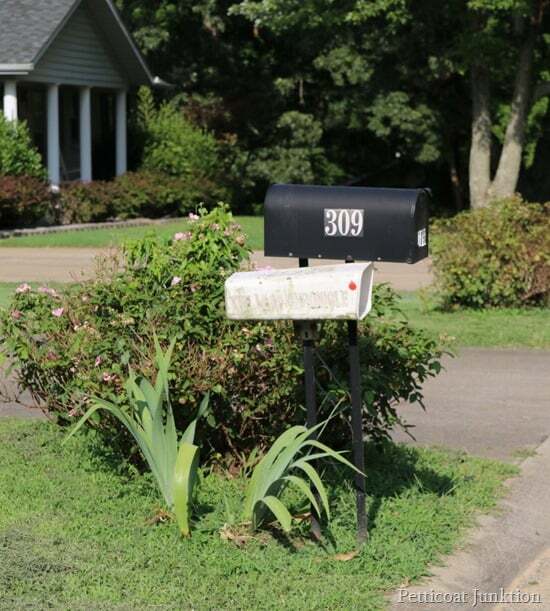 The house is lookin’ good and I think I need to paint the mailbox. I searched the internet for paint color ideas. 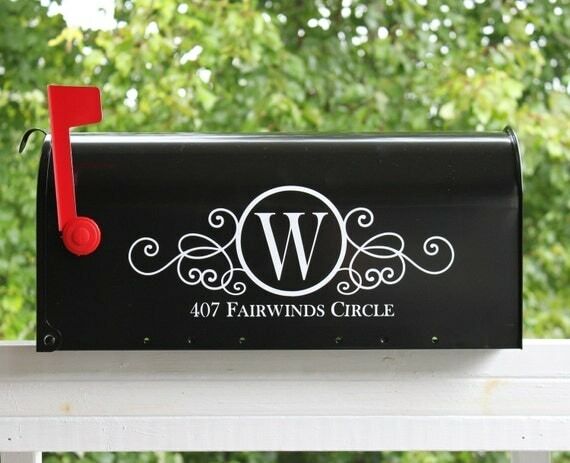 If you’ve never goggled painted mailboxes you don’t know what you’re missing. 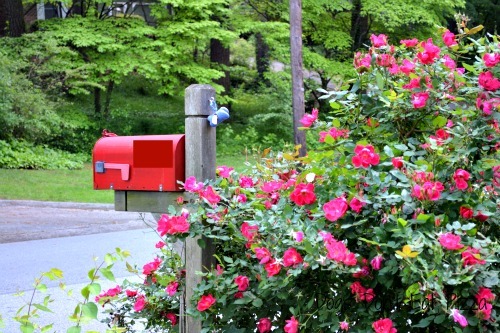 There’s everything from car shaped mailboxes to animal shaped mailboxes, and painted ones in every color of the rainbow. 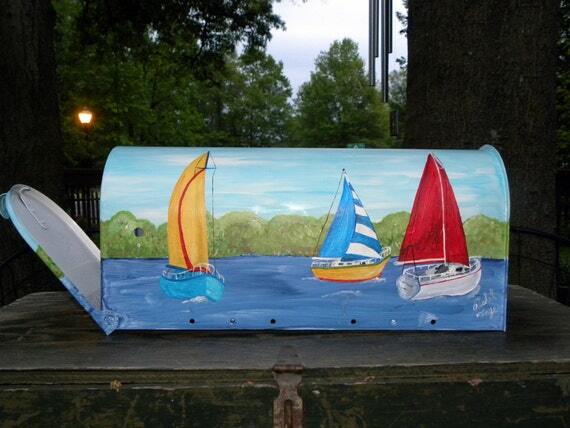 There are also a lot of mailboxes with scenes painted on them. This one is really pretty and it would look great on a waterfront property. Metallic copper…..I think this is the color for me. There were several monogramed boxes like this one…. I’m not sure about this particular design but I think a monogram of some kind would be cool. What do you guys think about the mailbox colors? Do you like the monogram idea? Let me know! 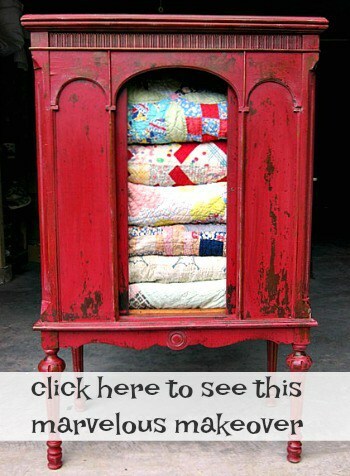 Subscribe to Petticoat Junktion updates and newsletter so you don’t miss a thing! I painted mine red last year – it really provides a pop of color and makes it easy to find when there’s 9 feet of snow! Rustoleum spray paint….works well. My favorite is the monogrammed one Kathy. I like the graphic they used and the font for the address. The pop of red on the lever is fabulous too. Looking forward to seeing what you come up with. In the meantime, I hope you don’t find your mail blowing in the mind along your street! I like the red one and think it would look great with a monogram as well. May do some experimenting soon! PAINT THAT NEWSPAPER BOX! 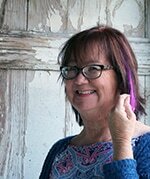 I’ve been the “paper-girl” for many years. So nice to have a reason to actually smile at 3AM! 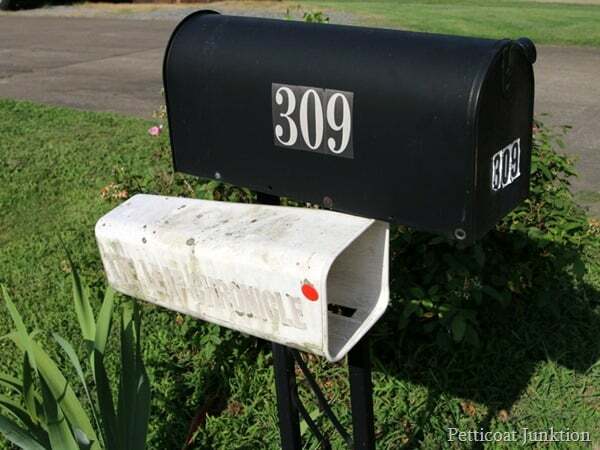 Some of my customers are very creative…paint, flower boxes, mail box covers, etc. Can’t wait to see what you decide! Oh my goodness! I love the red one! The monogram idea is pretty nice too. Whatever you do will look great. I like the monogram. I think I’m going to do this one on ours. Thanks for the tip.